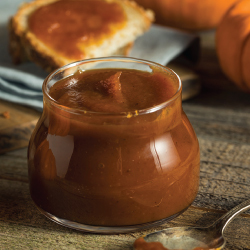 ‘Tis the season to make everything with pumpkin, and what better way than to make pumpkin butter. That’s right, pumpkin butter! You can use this in a variety of recipes, as well as simply spread it on a slice of toast for breakfast. Either way, you are sure to enjoy this all season long. Bring all ingredients to a simmer on medium-high in a sauce pan. Let reduce for 30-45 minutes until mixture is thick. Cool for 1 hour before serving.